WIKI: "Blood of the Beasts (Le Sang des bêtes) is a 1949 short French documentary film written and directed by Georges Franju. Blood of the Beasts was Franju's first film and is narrated by Georges Hubert and Nicole Ladmiral. 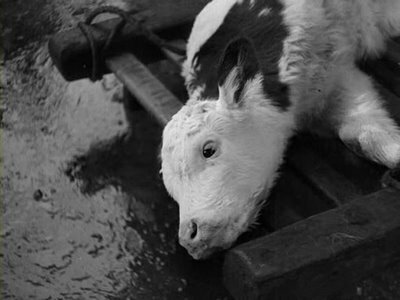 Franju's film contrasts peaceful scenes of Parisian suburbia with scenes from a slaughterhouse. The film documents the slaughtering of a horse, sheep, and calves; once the horse is stunned by a pistol, it is bled and butchered. The film is narrated without emotive language."